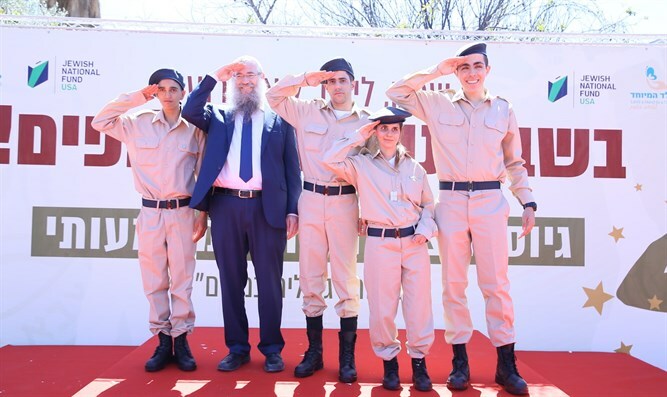 After a full year of volunteering for the IDF on the Palmachim Air Base in the framework of Special in Uniform, Shachak Shriki, Liron Nathan, Liel Katzav and Roi Kaufman, all of whom are youth with assorted physical and mental deficiencies, became full-fledged soldiers in the IDF. Special in Uniform, a joint project of the IDF, Lend-a-Hand to a Special Child, and JNF-USA, integrates youth with physical disabilities into the IDF, imbuing them with pride in themselves and their abilities and enabling them to function independently and contribute positively to society. Four adolescents with special needs received their teudat hoger (soldier identification cards) today. These young people enlisted in the IDF via the framework of Special in Uniform, a groundbreaking initiative which incorporates young people with disabilities into the military and helps them integrate long-term into society and the workforce. A red carpet was rolled out opposite the Mesubim Gate in the Bakum, and to the sound of trumpets playing, Shachak Shriki, Liron Nathan, Liel Katzav and Roi Kaufman fell into their parents’ arms, proudly showing off their very own Soldier’s ID that they’ve yearned and worked for so long to attain. In the framework of the Special in Uniform program, members volunteer for one year in the army, train and learn important skills before they graduate to become full-fledged soldiers. “Roi is very verbal,” she adds. “He’s spent the last year on Palmachim Airbase working for information systems, cleaning knives, kitchen duty, and deliveries. His lifelong dream was to be a soldier, to know that he could contribute to society like everyone else. Until last year, his life took the typical route of kids in the special educational system. He followed a very specific educational program in school and in a remedial afternoon program. “When he graduated twelfth grade, his high school in Ness Ziona, Tomer, offered assorted options for the future, one of which was to volunteer in the army. Due to his disabilities, Roi had received an automatic exemption, but that wasn’t enough to deter him. He was determined to volunteer for the army, and after a year, [his superiors], who recognized and appreciated his skills and capabilities recruited him to their ranks. Special in Uniform is internationally acclaimed for its unique, experiential and effective programs in which participants undergo evaluation and assessment by a professional team, followed by a three-month course teaching life and occupational skills. One of the major goals of the project is to imbue young people with disabilities with pride in themselves and their abilities, to function independently, and contribute positively to society. Today, the brand-new soldiers stood with shining eyes on a raised platform built especially for them. Chairman of Lend a Hand to a Special Child Lt. Col. (Res.) Gabi Ophir distributed the caps and dog tags together with the President of Special in Uniform and Afcon Chairman Israel Reif.